450 pages, 8.5x11, spiral bound. Colour C$ 148.00 [ISBN 978-1-897391-86-0 ]. B&W C$ 60.95 [ISBN 978-1-897391-87-7]. 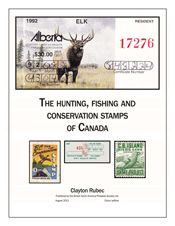 The latest BNAPS catalogue, The Hunting, Fishing and Conservation Stamps of Canada, was prepared by Clayton Rubec to fill a huge void in the published knowledge base of Canadian revenue stamps issued for hunting, fishing and conservation permits and fund-raising. Collectors of all stamps, and members of the hunting and fishing fraternity, will be amazed at the variety and colour of these stamps issued to date in Canada, and also that the author was able to gather together the vast amount of material. BNAPS wishes to sincerely thank Clay Rubec for compiling the book, and the whole Rubec family for preparing the printing files.